Last Sunday, the silver-gray sky and threatening rain clouds in the distance didn’t stop us from trekking out to a national forest, located on the outskirts of Warsaw. Kampinos National Park (Kampinoski Park Narodowy) is located in east-central Poland and covers an area of 407 square kilometres (157 sq. miles). We had visited the forest once before in early spring shortly after we moved to Warsaw, but this trip we headed out to see the remaining fall foliage and changing colors. We drove to the small village of Kampinos, 38 km. away from our apartment, turned north on a narrow, paved road and then found a spot to pull off on the side of the road. We saw a large pathway and some trail markers and so we decided to start our trek here. As we walked along, I noticed you truly could smell the forest – pine needles, tree bark and the musty smell of decaying leaves. It’s wonderful that we can escape the city for this gigantic forest and see the seasons change. I was hoping to see a moose, which the forest is known for, but we only stumbled upon several forest frogs (toads). These little, tan-colored guys practically blended right into the forest undergrowth. One thing that did not blend into its natural landscape was a bright red, white-spotted toadstool. This fairytale mushroom reminded me of that part in “Alice in Wonderland” when Alice is talking to the hookah-smoking caterpillar about eating the mushroom to grow big or small. However, this red mushroom is one you do NOT want to eat! Known as an amanita muscaria (fly agaric or fly amanita), it is considered poisonous and is noted for its hallucinogenic properties. We found dozens of other types of mushrooms, which Poland is known for, but we didn’t know if they were poisonous or not. We left the pockets of fungi to the foraging mushroom hunters which we ran into as we were ending our hike in the forest. Incidentally, I’ve been reading The Mushroom Hunters: On the Trail of an Underground America on my Kindle which talks about the crazy mushroom trade in the U.S., but also references Poland and its mushroom notoriety several times. Definitely a good read! A family of Polish mushroom hunters out for a Sunday trek. We exited the forest empty handed and drove back into Kampinos. The few stores all seemed shuttered on Sunday except for a small pizzeria, La Foresta. We ordered the mushroom soup, of course, and a delicious pepperoni pizza. Until we know what’s edible and what’s not, we’ll leave the mushroom picking to the locals. i have always wanted to learn about mushrooms! my father and grandfather were mushroom experts but never taught me. i love being out in the forest too! We have morel mushrooms growing here in our pasture... they are SO GOOD cooked in butter and breaded. I have never seen a red cap like you found... it was beautiful, as was the forest! The only mushroom I'm confident to pick is a puffball as it can't be mistaken for anything else. @Mary Ann, Oh, I love morels! We used to buy them by the crate when they were season esp. last in Maryland! My executive chef would make all sorts of delicious specials when them! Yum! Enjoy 'em while you can! @Annie, I didn't even know what a puffball was! Apparently, only some varieties are edible. Are these the ones you know? Those ARE Alice in Wonderland mushrooms!!! SO PRETTY! Yes, those red and white ones are definitely best avoided... But they are beautiful to look at - and when I was a kid I learnt that they were the "guards" of some other very tasty mushrooms (that I should remember the name of but don't). They live in a kind of symbiosis so when you find the one you will find the other close by - but the other one is diffiicult to find. Haven't been here in so long, definitely have a lot of reading up to do, I can see! Love the autumn colours. @AK, welcome back! We still haven't gone mushroom hunting, but I do stop by our farmer's market for them instead. Much easier! 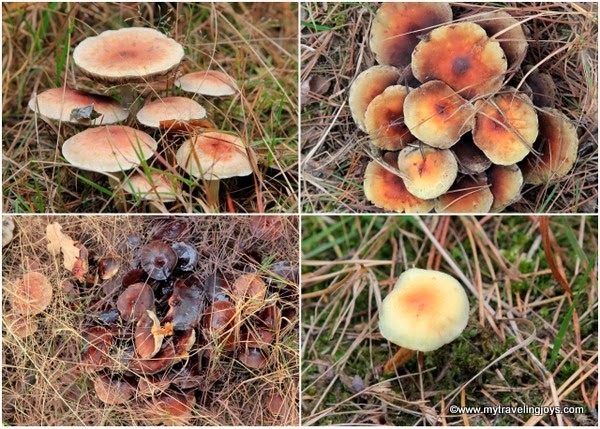 Fall Foliage, Forest Frogs and Fungi at Kampinos National Park near Warsaw. Your posting is very rich as you shared very informative content. I read and enjoyed a lot. Thanks a lot.